To receive WECAN news and updates, sign up for our email newsletter. A hands-on and discussion workshop about the practical classroom applications for working with etheric streams, part of the human energy system, or the life force body as it is also referred to. Taught by Jane Swain. This course will build insight and practical skills for the teacher in the realm of physical, soul, and spiritual support for the child, parent, and self. Taught by: Jane Swain, Janene Ping, Nancy Mellon and Michelle Brooks. Find new strength and strategies to counter-balance disembodied electronic devices, arrhythmic environments and many a minor and major developmental challenge, and health concerns. Taught by Nancy Mellon and Janene Ping. During this course, beginning with the teacher's own self-awareness, we will attend to essential creative activities that lead to specific positive and meaningful relationships. This week-long deepening, open to experienced EC teachers, will explore the art of mentoring through a variety of approaches. This will be especially helpful for those who are, or want to be, mentoring in their own schools and in the wider movement. With Louise deForest, Heather Church and Wendalyn von Meyenfeldt. We will explore the profound human capacities and the sensitive processes that blossom forth in the first three years and will learn how best to support the developmental process of very young children. Taught by Susan Weber, Jane Swain, Janene Ping, Kim Snyder-Vine. We will build a background for this work, including exploration of the essential aspects of these classes for families, the content and rhythm for a group, the needs of different developmental stages, and an introduction to the needs of parents of young children. Taught by Susan Weber, Nancy Macalaster and Katherine Scharff. The week focuses on the development of the child’s emerging self and social capacities between two and four years, conflict in two and three year olds, sensory development as a foundation of social competence, the primitive reflexes, and the development of the child’s hand. Taught by Susan Weber, Jane Swain, Katherine Scharff, Michelle Prindle. Join a week long exploration of the inner and outer artistic and practical activities of a Waldorf teacher. Taught by Heather Church and Michelle Prindle. In this week-long immersion into the world of early childhood, you will experience hands-on lessons in circle, handwork, story and puppetry. You will be introduced to child development from birth to seven, inner development of the educator, and the essentials of Waldorf Education for the young child. 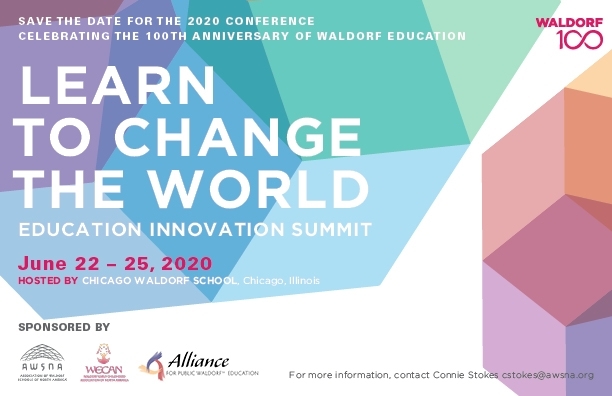 The conference is the culmination of the year-long festivities celebrating 100 years of Waldorf education worldwide. AWSNA, WECAN and APWE invite you and your colleagues to join us in celebrating our past and planning for the future. This gathering in the beautiful Pacific Northwest is for anyone interested in lighting the fires of imagination and strengthening the heart, through storytelling and puppetry. Workshop leaders include: Janene Ping with color and light puppetry, Jennifer Aguirre with artful pocket apron puppetry (on strings, fingers and hands! ), and Susan Strauss, eurythmist and professional storyteller. We will also enjoy several shared performances from participants! For further information contact lehman.katherinedu@gmail.com. Discover new ways of being with yourself and with children through playful experiments with Ute Strub. Sponsored by Pikler USA. Observation is the key to understanding infant and toddler needs and behavior. During this seminar, you will learn about the methodology for observation, and you will practice and grow your own skills. Led by Hungarian faculty from the Pikler® House in Budapest, Judit Kelemen, Dr. Eszter Mózes and Elsa Chahin. Sponsored by Pikler USA. Participants of this seminar can explore the intact, natural process of motor development, which can only be observed if we do not directly intervene in movement. Led by Hungarian faculty Dr. Gabriella Püspöki, former Director of the Pikler Institute, Szilvia Papp and Elsa Chahin. Sponsored by Pikler USA. Visit our Facebook page for links to news and research, upcoming events, updates from WECAN members, and more! See the newest books available in our store.